The alleged misdeeds of Qin Shihuang climaxing in his order to bury four hundred and sixty Confucian scholars alive, made material for an often-recalled story during two millennia. In Imperial times, the Chinese elite celebrated this burial as an example of their equals fighting against tyranny without the least fear of death and in modern times no other tale has filled the Anti-Confucian-Campaigners with such delight as that of Qin Shihuang interring the Confucianists deep under the earth. Among the emperors of China the First Emperor, Qin Shihuang 秦始皇, remained the most famous throughout history. His reputation is founded on his despotism. Yet his actual significance is based on his unification policy: After he had conquered the Six States, he established in 221 B.C. his rule over the whole realm. Under the guidance of his legalist advisers, he introduced an administrative system, that formed the background of Imperial government until 1911. In the course of the unification, he standardized the law, the coinage, the script and weights and measures. All carriages had to have gauges of the same size. To accelerate communication between the capital Xianyang and the provinces, he ordered the construction of a net of roads and channels. Within a decade, Qin Shihuang converted a fractioned feudal society into a centralized bureaucracy. The First Emperor believed that his policy was preparing the world for the eternal rule of the Qin, but the dynasty survived him by only three years. Instead of being remembered as the unifier of the Chinese Empire, he became despised as an incompetent tyrant. Written in the time of Han, the reports on his rule mention his great reforms only in passing. A detailed description of his unification policy does not exist. The reason for this silence is that the Confucianists found the story of Qin Shihuang too useful to allow an objective assessment; they considered his and his dynasty’s fate as perfectly suited to admonish future emperors. Hence, they concealed the positive sides of his rule and excessively emphasized the negative aspects. Beginning with the time of the Han Emperor Wu (漢武帝 140-86 B.C. ), the Confucianists, not content with merely biased judgments, gradually invented additional tales about Qin Shihuang. Among those legends the one of the martyrdom of the scholars, entwined with the authentic story about the burning of the books not in the emperor’s favor, became most famous so that finally in the Chinese tradition the reign of Qin Shihuang was reduced to the formula: Burning the books and burying the Confucian scholars alive (fenshu kengru 焚書坑儒). During two millennia of Confucian rule, the First Emperor remained the fiend who had emerged to destroy the vessels of truth, namely the books and the scholars. As long as the Confucian bureaucracy was firmly established, only some eccentrics of Li Zhi’s stamp dared to doubt the official judgment on the “Tiger of Qin”. Only when in our century the image of the past changed with the collapse of the Empire, modern historiographers stressed the lasting merits Qin Shihuang deserved for China’s unity. The negative aspects of his rule receded proportionately. Thus the losses occasioned by the burning of the books, were given less weight, when historians referred to the destruction of the Imperial library by rebels as the chief cause for the big gaps in the pre-Han literary tradition. Yet up to the present, the emperor remains in Chinese and Western accounts incriminated with the murder of the Confucianists. The answers produced by scholars in reply to this query were dictated less by the intention of elucidating the history of the  vanquished Qin Empire than for warning the early Han monarchs against the dangers of unbridled despotism. For the scholars who were at the mercy of an absolute ruler, it was quite literally vital to convince the autocrat of the pernicious results that ensue from violence. Their message to the emperor said in short: If you take our life, Heaven will take the life of your dynasty. Lu Jia was the first scholar at the Imperial Court to base an essay on this admonition. Sometime after the establishment of the Han dynasty (206 B.C. ), he engaged its founder Liu Ji in a discussion on the fortune of the ruling houses arguing: Qin Shihuang’s insistence on punishment (xing 形) and law (fa 法) at the cost of benevolence (ren 仁) and righteousness (yi 義) caused the destruction of Qin. Liu Ji unsettled by his adviser’s words, finally ordered a written report on the reasons why the Qin lost their empire. Lu Jia responded with a work in twelve sections, the Xinyu 新語 (New Discourses) and presented it to the throne, section by section amidst the loud cheers of the imperial retinue. In the Xinyu the author assumed the task of inducing his emperor to imitate the conduct of a Confucian sage. This was certainly no easy task; for nobody knew better than Lu Jia that Liu Ji had subdued his enemies through slyness, disloyalty and ferocity. Lu had accompanied the conqueror during his military campaigns, serving him as rhetorician on difficult diplomatic missions. Thus he participated in the negotiations to obtain the release of Liu Ji’s father after the old man had been taken prisoner by his son’s rival Xiang Yu 項羽. When Xiang Yu threatened to boil the father alive in order to force the surrender of the son, Liu Ji displayed his willpower although scarcely the filial piety required of a gentleman, by requesting a bowl of soup made from the resulting juices! Xiang Yu, according to the generals, had claimed on the contrary all spoils for himself and was jealous of able followers. Therefore, Liu Ji won and Xiang Yu lost. The emperor agreed and completed this appraisal of his ascension to the throne with a lecture on the importance of making use of clever men. This whole incident demonstrates the attitude of a thief: A good gang-leader must share the spoils honestly with his accomplices. In this way, he attracts the wiliest scoundrels and his gang will outdo that of any rival. Although Lu Jia claimed the Mandate of Heaven for his emperor, he did not cling to the traditional point of view that Heaven singled out the wise and virtuous to found a dynasty. He maintained that to conquer the world one cannot be a sage, yet the emperor must become a sage to legitimatize himself. Accordingly, the failure of Qin was not due to an illegitimate ruler’s conquering the world, but rather to Qin Shihuang’s unwillingness to modify his behavior after the establishment of the Empire. First, the heroes of Chinese history and mythology are called in to provide unquestionable evidence that only a kindhearted ruler can secure a lasting reign; Yao, Shun, Yu, King Wen, the Duke of Zhou and Duke Tai are all exemplary paragons of virtue. Then, the villains who brought their dynasties to ruin are paraded before the reader: Count Zhi 知伯, who relied on awfulness (wei 威), trusted in force (li 力) and was destroyed by an alliance of enemy states; Li 厲 of Jin, Zhuang 莊 of Qi and Ling 靈 of Chu, who once ruled over great states, yet “by insisting on their superior strength lost their states. They intensified punishments and through this, destroyed themselves. That serves as a warning from the past and an example for the future!” Of course Jie 桀, the last Xia ruler, and Zhou 紂, the last Shang ruler, also figured among the villains. But the focal point of the warnings is an accusation against Qin Shihuang. The Xinyu enumerates his crimes: He took delight in punishment and retaliation and introduced the torture of stretching on the wheel. His armies terrorized the entire realm. Being proud and extravagant, he built high terraces and extensive palaces. This artful attempt to fight tyranny by prescribing a passive role to the ruler, refers to a chapter in the Lunyu (Analects), wherein Confucius praises the mythical emperor Shun. Shun says Confucius, governed without acting. Thus, Lu Jia contrasts the harmonizing inactivity of Shun with the inappropriate busyness by which Qin Shihuang led his dynasty to the abyss. Although Lu Jia visibly endeavors to illustrate his warnings with a most gloomy picture of the First Emperor, he does not refer to the outrages that in later times became synonymous with Qin tyranny: His treatises never mention the story of the notorious burial nor the burning of the books. The Xinyu has not been handed down to us in the best condition and we have to consider the possibility that it once contained reports on the two events in passages which have been lost long ago. Although (or maybe because) the Xinyu is considered the earliest Confucian text written in Han times, the literati did not deal with it very carefully. For them Lu Jia was not such an important author as he had neither the authority of a pre-Qin writer, nor was he, in view of his open declaration for eclecticism, an accepted founder of Han Confucianism. Thus his works fell into oblivion. Yet after centuries of negligence a certain Li Tingwu 李廷梧 collected all fragments he could secure and published in A.D. 1502 a reconstruction of the text, said to be nearly complete. All current editions of the Xinyu are based on this reconstruction. The thesis that the Xinyu contained no references to burnt books and buried scholars can also be upheld even if we doubt the reliability of its modern editions. For the following reasons: When some decades after the death of Lu Jia the formula “fenshu kengru“ came into circulation, the Confucianists would surely have welcomed the slightest evidence referring to these crimes. As Lu Jia was an eye-witness of the Qin reign any utterances by him concerning the important issue would have been taken up and cited in many other writings. Thus his evidence would have been preserved irrespective of the original source’s condition. Painted album leaf. Anonymous, 18th century. Bibliothèque Nationale, Paris. An event like the murdering of four hundred and sixty Confucian scholars was monstrous enough. So a treatise dealing with the despotism of the First Emperor should mention it. That the Xinyu contains no comment on this atrocity, proves the whole story as a later invention. Lu Jia’s silence on the burning of the books however, does not defeat later reports on this measure. As a man who seized every opportunity to cite from the Book of Documents (Shujing) and the Book of Songs (Shijing) he felt irritated on the destruction of such texts. On the other hand he certainly appreciated the emperor’s attitude; afraid of diverging political opinions. Qin Shihuang had tried to standardize the mind of his people as he had previously standardized weights and measures. This idea to destroy anything not in accordance with one’s teaching was well known to the Confucianists. Long before Qin Shihuang proceeded to action, Mencius shrilly denounced his opponents for deluding the people and called for the suppression of „heretical doctrines“ (xieshuo 邪說). That some decades after the composition of the Xinyu the burnt books nevertheless became an important issue is connected with the emergence of the New Text School. We will revert to this point. The need for a benevolent and righteous monarch became more urgent than ever after the death of Liu Ji in 195 B.C., when his widow the Empress Dowager Lü 呂太后 usurped rule over the country. Fifteen years of most wicked despotism followed. During this period, the Empress Dowager sought to consolidate the power of the Lü clan and to repel the Liu clan. Many officials who stood in the wrong camp were executed. The conflict ended with the natural demise of the Empress Dowager and the systematic extermination of her relatives. It was with great expectations that the scholars hailed the ascent to the throne of Liu Ji’s fourth son as Emperor Wen (文帝 180 B.C. ); for the first time the united China now had a monarch not incriminated by a long record of atrocities. Qin Shihuang, the long expected sage? For the Confucianists of later times this idea must have sounded absurd. For us it is evidence that the First Emperor was not even by his enemies considered the personified evil from birth. At the time of Jia Yi (201-169 B.C.) 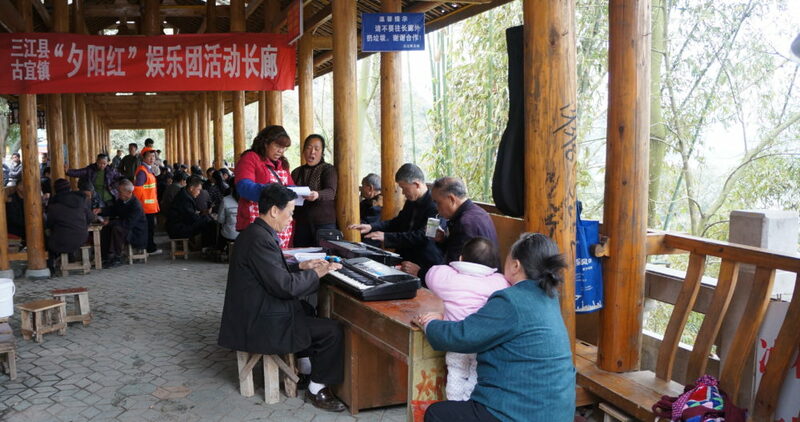 the older generation could still remember the rule of Qin. As long as the eye-witnesses were still alive there was no chance that the pseudo-sage could become a figure to whom imaginary deeds were attributed and thus Jia Yi‘ s evaluation of Qin Shihuang is biased but free from flight of fancy. According to Jia Yi the First Emperor had failed the time of probation imposed by Heaven. He investigated the reason for that and summarized his findings in Guo Qin 過秦 (The Transgressions of Qin) a treatise which became famous as a primer on despotism. The recipient of Jia Yi‘ s treatise was again Emperor Wen. Boisterous jubilation over the sage ruler of Han could not obscure the fact that the celebrated emperor was a dedicated follower of Legalism. In order to sound a warning as Lu Jia before him, Jia Yi describes the fall of the Qin dynasty. He describes the rise of Qin Shihuang, his victory over the huge armies mobilized by the Vertical Alliance and his daring campaign deep into barbarian lands. He also recalls the unique strategic position of the capital within the Pass, which was protected by strong garrisons. Qin seemed to be forever invincible. But then, a band of ragged conscripts with weapons improvised from hoes and sticks shook the Empire, and the powerful dynasty collapsed. This disaster, according to Jia Yi, was caused by the Qin emperor’s refusal to abjure their practices of punishment and deceit (zha 詐). Jia Yi repeats the familiar reproaches on the multiplication of laws, the intensification of punishments, and the increase in taxes and of socage. Yet he also adds a story unknown to earlier sources: the burning of the books. He tells that Qin Shihuang decreed the destruction of all writings propagated by the Hundred Schools of Philosophy in order to make the people ignorant. This explanation must be considered an admittance of common failure which contrasted the sublime values propagated by the Confucianists. There were scholars at the Qin court who opposed the tyrant in secrecy, among them many Confucianists, but no man like Bigan stood up and articulated his grievances. Seventy years after his death Qin Shihuang was assigned an additional role. Thus far he was only a bugbear who warned the Han emperors against harsh government and unreasonable activism. When the Han Emperor Wu established Confucianism as a bureaucratic monopoly, in order to supply the realm with officials, a need developed for a cohesive myth welding together the diverging elements which accumulated under the roof of this favored school. Thus Qin Shihuang became the fiend who had emerged to destroy the Way guarded by the Confucianists. Eclecticism was the Confucian answer to modernization. The aspirations of the literati to the sinecures of the new empire were difficult to reconcile with their enthusiasm for antiquity. Yet they were sagacious enough to realize that this Golden Age of antiquity was an unfit example for governing a centralized state. They also understood that their traditional ideas were by no means helpful in solving the political problems faced by the Han dynasty. On the contrary, the Han dynasty judged by orthodox Confucian doctrines lacked any legitimate right to rule. Moreover, orthodox doctrines supported the restitution of feudal structures. These two existential problems collided with imperial interest. Not all Confucianists approved of eclecticism. An embittered orthodox minority observed their fellow scholars borrowing freely from the teachings of alien schools to fit to the changing social conditions. Even during the reign of Liu Ji, when the first group of Confucianists entered the Imperial services, orthodox voices made themselves heard. They complained that those literati currently seeking public office, did not follow the Way of the Ancients. In turn, the court scholars ridiculed the orthodoxy as “vulgar Confucianists (biru 鄙儒) who do not comprehend that times are changing.” Things got worse, from an orthodox point of view, when after the death of the anti-Confucian-minded Empress Dowager Dou (135 B.C.) her grandson Emperor Wu appointed several hundred Confucian scholars to his administration. Among them was Gongsun Hong 公孫弘, a former pig-breeder, who advanced to the highest offices as an expert in interpreting the Chunqiu (Spring and Autumn Annals 春秋). Incited by reports of such fabulous career possibilities, all office-seekers flocked together under the roof of the Confucian school and started to study the Six Classics. Sima Qian remarks sarcastically upon the onset unleashed by the story of Gongsun Hong’s rise: “Henceforth the scholars (xueshi 學士) throughout the Empire followed the trend.” The distinct esprit de corps which had knitted together the Confucianists during the epoch of the Warring States became ever weaker as more and more of them reached office. In two movements called the New Text and the Old Text School the Confucianists tried to overcome this dispersal. The New Text (jinwen 今文) scholars united the hitherto incoherent eclectic  ideas into a system of learning. They argued that because of the losses due to the burning of the books, the Confucian teachings needed to be completely restructured. They were referring to an “oral tradition” (koushuo 口說) and „secret words“ (weiyan 微言) said to be traceable to Confucius. This artifice helped them to declare their syncretistic work as the legacy of the great sage. Above all the „secret words“ were instrumental in forming the New Text version of Confucianism: The scholars developed with extensive commentaries and sub-commentaries to the Chunqiu a timely political theory. At the same time, they created an immense cohesive power with a doctrine, which the community of literati attributed to saving the tradition through the perils of Qin rule, when the books went up in flames. Additional cohesiveness was then derived from the feeling of a closed group initiated in secret words. As soon as the first New Texts were published, Dong Zhongshu 董仲舒 (179-104 B.C.) submitted a memorial to Emperor Wu, which urged him to declare those writings for Imperial dogma and to cut off the competing teachings propagated by the Hundred Schools. The New Text scholars soon realized that the process of textual „reconstruction“ which they had launched resulted not only in cohesive powers. The creative license yielded by a system of learning based on “oral tradition” and “secret words” meant a permanent danger to the consistency of their doctrine. As long as the literati used their inventiveness in conflict, only with the emperor or non-Confucian cliques it proved very advantageous to them. However as soon as they had a political quarrel among themselves and each party referred to arguments from the New Texts, the „oral tradition“ became destructive to Confucian solidarity and weakened the position of the literati against their adversaries. The creation of the martyrs’ legend and its propagation through the formula “fenshu kengru” thus is connected with the beginnings of the Old Text School. Kong Anguo, by “proving” the existence of a continuous line of written tradition tracing back to his great ancestor shows that neither the destruction of books nor the persecution of scholars could interrupt the Way. Sima Qian’s description of the events leading to the death of the “masters” is only concerned with the magicians. The masters here no doubt were magicians. Except the strange remark ascribed to Fusu, that all the masters distinguished themselves through Confucian virtues, no word suggests any connection between this affair and the Confucian school. Certainly Sima Qian was aware that the contempt of the literati for the magicians was as big as the magicians ignorance of the Confucian teaching. So why did he create such confusion by labeling the magicians as followers of Confucius? The things took approximately the following course: In early Han times there circulated an authentic story about some magicians at the Qin court who had died in pursuance of their risky vocation. Scholars like Lu Jia and Jia Yi might have known this story but naturally, they were not disposed to look at the elimination of such troublemakers as a misdeed which is to be added to the list of Qin crimes. When Kong Anguo heard of the affair, he used it for his own end by turning the dead magicians into Confucian martyrs. Now Sima Qian was in a quandary: As a historian, aspiring for a factual, though not fully objective picture of Qin Shihuang. Moreover, as a member of the bureaucracy he felt obliged to support the legend created by his mentor Kong Anguo. Thus he just told the whole story according to his knowledge, yet added this half sentence in Fusu’s remonstration, which imputed Confucian inclinations to the magicians. Although Sima Qian in his work never mentions any ru 儒 (literatus, Confucian scholar) involved in this gruesome affair, his descriptions were sufficient for all later historians concerned with the Qin reign to consider him the chief witness of the Confucian martyrdom. On the execution of the masters, Sima Qian only reports that they have been killed (keng 坑). He uses the word “keng” several times in his writings and from the context we learn that it has to be translated “to kill” and never “to bury alive”. Originally standing for “pit, moat”, “keng” took the meaning of “to trap and kill” and is frequently used by Sima Qian in describing troops who annihilate an enemy army. From now on “keng” took the meaning “to bury alive”. Wei Hong’s attempt to adjust the content of the legend to the formula “fenshu kengru” proved not so convincing. To Wei Hong it seemed first of all important to depict the victims of Qin Shihuang as real Confucianists. Sima Qian’s authority, however, rendered such an intention extremely difficult as he had shown that the masters were mere magicians. Wei Hong dispensed with the attempt of imputing Confucian propensities to the masters as Sima Qian had done. He instead tried to have the boshi and xianru involved and opposed them to the masters; the role of the Confucianists in this story was not very impressive, though. The fact that they appeared quarrelsome instead of behaving like heroes could not stop the veneration for the „martyrs“. Wei Hong’s tale closes the creation of our legend. From now on it experienced only minor changes and additions. Some decades after the publication of Wei Hong’s writings, the great skeptic Wang Chong (A.D. 27-ca.100) in his Lunheng (Discourses Weighed in the Balance) discussed the errors of his contemporaries and tried to uncover some wide-spread Confucian teachings as legends. In this connection he also got down to the imaginative assertions concerning the life of Qin Shihuang. The role of the masters in the affair was now completely inverted. Whereas in Sima Qian’s report their model was still Confucius, they now appear as enemies and slanderers of the literati. These objections of a skeptical outsider did no damage to the legend. The martyrdom of the Confucian scholars in Xianyang remained a famous “historical incident” even in our days. Print edition: Nation and Mythology (in East Asian Civilizations. New Attempts at Understanding Traditions), vol. 2, 1983, eds. Wolfram Eberhard et al. :121-136. Li Zhi 李贄 (1527­-1602), Cangshu 藏書 (Concealed Writings, ed. 中華書局, Peking 1959), 2 :13 et seq. Jia Yi 賈誼, Xinshu 新書 (ed. 世界书局, Taibei 1975), Baofu 保傅 5 :3b. Sima Qian 司馬遷, Shiji 史記 (ed. 中華書局, Peking 1972), 97 :2699. Lu Jia 陸賈, Xinyu 新語 (ed. 世界書局, Taibei 1975) 1 :3.
 cf. James Legge, The Chinese Classics, vol. 1, Confucian Analects, The Great Learning, The Doctrine of the Mean, London 1865 :295.
 cf. James Legge, The Chinese Classics, vol. 2, The Works of Mencius, London 1865 :283.
 cf. J. Legge, vol. 2 :232, 501 et seq. Xinshu, Guo Qin 1 :4a. Xinshu, Guo Qin 1 :7a. Shiji 99 : 2722 et seq. Ban Gu 班固, Hanshu 漢書 (ed. 中華書局, Peking 1975), 56 :2523. Shangshu zhengyi xu 尚書正義 (Correct Meaning of the Book of Documents, in 十三經注疏, Thirteen Classics with Commentaries, ed. 世 界書局, Taibei 1975) 1 :3a/b. Wei Hong quoted in Yan Shigu’s commentary to the Hanshu 88 :3592. Wang Chong 王充, Lunheng 論衡 (ed. 世界書局, Taibei 1962) 20 :413.